The Converse Blog: Glen Davis joins team Converse? Our friends over at CeltKicks.com posted this picture up on their website last night. It features Rondo and more importantly Glen Davis rocking at Converse t-shirt. 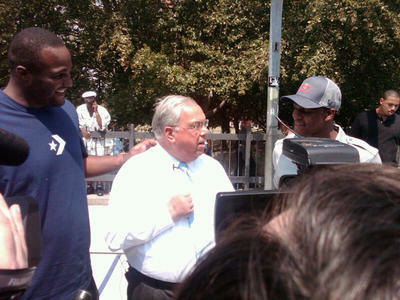 Glen showed up to lend his support to Rajon Rondo at the dedication of a refurbished basketball court at Malcolm X Park. There as been no announcement from Converse, but hopefully Davis will be rocking the Star and Chevron if and when the NBA season tips off. Plus it would be nice to see him do that in Celtic Green. Davis joins Jimmer Fredette as NBA players seen wearing Converse shirts this off season...hopefully Nike and Converse is willing to spend some money to upgrade their roster of players. You'd think after doing 2.4 Billion in sales last year Nike and Converse could spend a little bit on signing some new players to grow team Converse. It worked out well in signing JJ Barea just saying....or gasp, even spending some of that money to return to College Basketball, especially if there is no NBA season. Okay, I just stepped off my soap box haha. As always if I hear anything new on this issue I'll be sure to let you know.